To make a fabulous birthday cake for your child you will need two sets of equipment: one for baking the cake, and one for decorating the birthday cake. Basic equipment is fine for baking the birthday cake, and depending on what type of cake you want to make, you may need cake moulds. You will probably have the majority of equipment needed to bake a cake at home, such as mixing bowls, wooden spoons, whisk, etc. You can either make the cake in the food processor or by hand in a mixing bowl – it doesn’t really matter which you choose – it is all down to preference and time. Equipment for decorating the birthday cake is essential to creating a wonderful cake. Without the cake decorating equipment, you won’t be able to create a brilliant birthday cake. The cake decorating equipment will also make your job of decorating the birthday cake much easier. An angled spatula – You will probably be using icing to cover your child’s birthday cake, and to make sure that you get a professional and even covering, you will need an angled spatula. 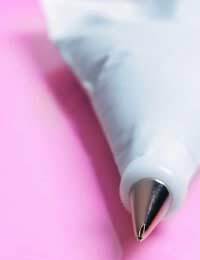 Piping bag – If you want to create decorations with icing on your child’s birthday cake, you will need an icing or piping bag. The different nozzles will make shapes and decorations look more professional. Turntable – Decorating birthday cakes can sometimes be a tedious task. If you have a turntable your job of decorating the birthday cake suddenly becomes much easier. You won’t have to pick the cake up and turn it around, nor will you have to stretch over the cake to decorate the other side. With a turntable, you can quickly turn the cake round to the angle you need it at. You don’t have to buy a turntable; you may be able to hire them from your local cake shop or bakery. Cake Toppers – If you want to add cake toppers to your child’s birthday cake, you can find a wide selection either in shops or on the Internet. Some cake toppers are extremely elaborate, such as train tracks with moving trains, moving/dancing figures and so on. Some cake toppers are collectable, some are edible. Sugarcraft gun – If you want to go all out for your child’s birthday cake, you may want to buy/hire a Sugarcraft gun. You can create ribbons, hair for dolls and figures, and ropes for a boat cake out of marzipan or flower paste. Textured rolling pins – these rolling pins are fantastic for creating that little something different. You can buy textured rolling pins in a variety of patterns, and they will make your cake look outstanding! Cake stand – If you are creating a birthday cake for everyone to marvel at, you will need something special to stand it on. You can get lots of different types of cake stand, and you should be able to hire the bigger ones from a local cake shop. Choose from many different birthday cake stands such as tiered stand, round bases, square bases, glass bases, or stands for displaying small, individual cakes. Cake decorating can be simple and it can be elaborate. You will have to decide ahead of the party which you feel more comfortable with. You can find a large variety of cake decoration equipment at specialist online retailers, and you may even be able to find some cake equipment in your local supermarket.